Many of us are forced to run our lives through email due to its sheer expansiveness. It’s our default business communication tool, appointment scheduler and project manager. In fact, professionals spend on average 28 percent of their time reading and answering emails, according to a McKinsey study. While instant messaging tools like Slack and Hipchat are starting to turn the tide for internal teams, even Slack founder Stewart Butterfield admitted to using email for all his external communication. 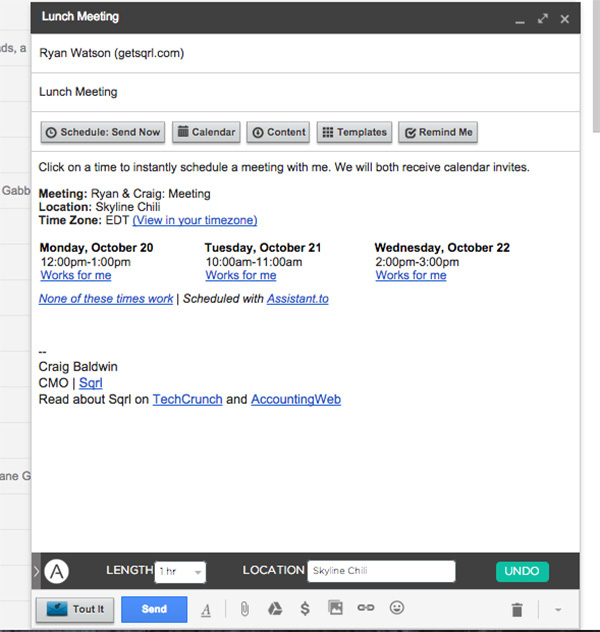 Our team uses Gmail for Work, part of the online productivity suite Google Apps. I know many of the up-and-coming accounting firms out there do as well (so does accounting software company Xero). We’ve seen just about every Gmail plugin available in our efforts to get to inbox zero. So with that experience, I wanted to give my 5 favorite free Gmail plugins to supercharge your email. Assistant.to is the best free plugin I’ve used in regards to scheduling. While I was formerly a user of ScheduleOnce, I couldn’t bear the thought of spending $20/month on something I used so infrequently, making Assistant.to the perfect fit. By integrating with your email and calendar, Assistant.to allows users to select any number of free meeting times and drop them straight into outgoing emails. The recipient can select any one of the options and the meeting automatically shows up on both calendars. This application is still very young, but I love the path Assistant.to is on. Do you remember the early days of Rapportive, the simple email plugin that would give you loads of social information about contacts you were about to email? After their Linkedin acquisition, Rapportive has become a shell of itself. However, Discover.ly has recently appeared to take over that spot by providing much of the same information right in your inbox. With Discover.ly’s chrome widget you can see relevant info and social connections about email contacts, even if you’ve never met them before. Discover.ly is perfect for discovering useful connections for possible sales and marketing targets and with the price of free, it’s hard not to give it a try. Feel like you’re getting weighed down by the long list of newsletters you have signed up for throughout the years? That’s exactly what Unroll.me is for. 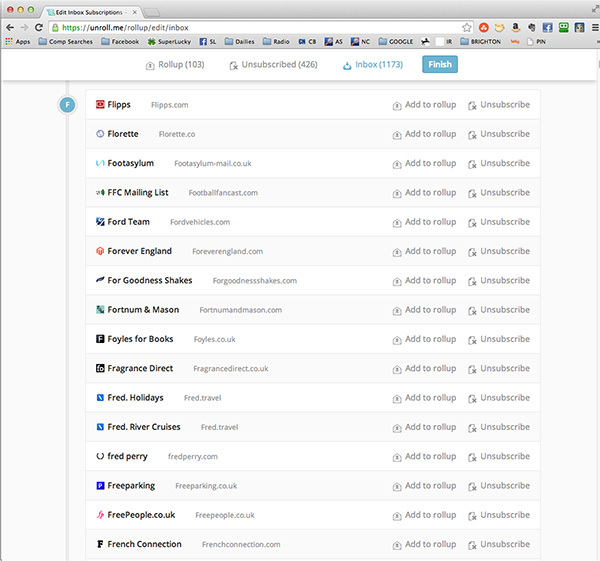 Connect Unroll.me to your Gmail account and get an entire list of your subscriptions. With unroll.me you can receive all of your email subscriptions once, anytime you’d like with the “daily rollup” feature. That way you can easily read (or ignore) all of those product updates or “37 ways to change your life” emails on your own time. Clientele helps you stay on top of your follow-ups like Boomerang, but over time Clientele will learn your contacts’ response habits and begin reminding you of the best times to follow-up with no work involved. 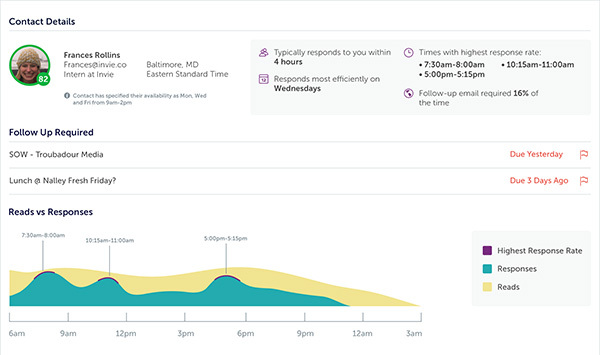 With enough data Clientele will be able to tell you the best time to email your contacts, how long they typically take to respond, and how often you have to follow-up before receiving what you need. All of that information is used to score your entire list of contacts (or clients) so you can easily stay on top of present tasks and avoid future issues. 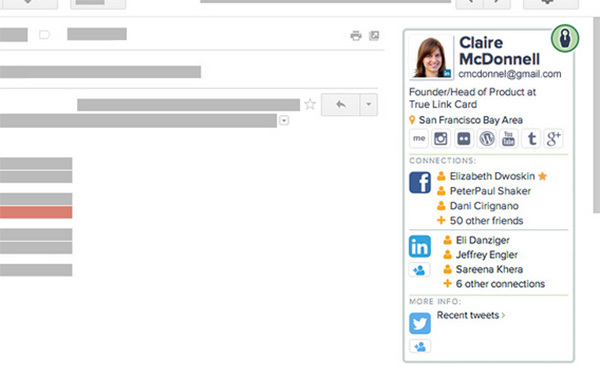 Many marketers are using open and link tracking services these days. Plugins like Yesware and Tout (a favourite among our team) have become musts for those of us looking to work our sales pipeline. However, Sidekick provides much of the same functionality for none of the cost. 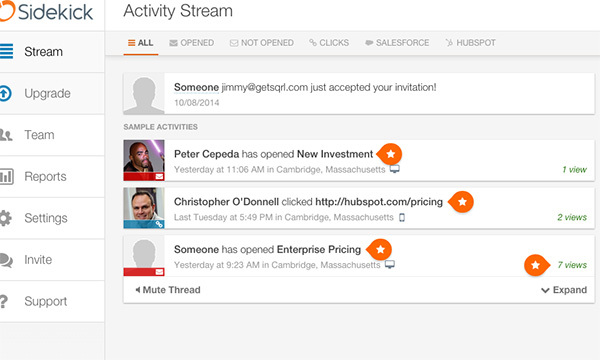 Sidekick was created by Hubspot, long-time masters in the digital marketing space. Sidekick’s useful opened email notifications and link tracking allows you to quickly plan your next move. With their intent to add “scheduled” emails as a feature, I could see Sidekick undercutting a lot of higher-end platforms typically out of reach of SMBs and solopreneurs due to the high cost. I wanted to provide some cool up-and-coming mobile applications that productivity junkies will love. While widgets work great on your computer, they’re typically not accessible on tablet or phone operating systems. Many of you probably know of Mailbox, which dominated the inbox zero movement just over a year ago. But other apps like Humin and Accompli are tackling cumbersome mobile issues like contact management, calendars, and attachments. Our team tried each over the last several months and loved the functionality, design, and ease of use. With the way things seem to be going and the explosive growth of mobile devices, we expect many other competitors to pop up in the near future. If you have some plugins you love to use that I didn’t mention, from one productivity junkie to another, I’d love to hear what you got! When Nico Miceli decided he wanted to help his aunt record her baby’s first years, pulling out a video camera seemed a little old-fashioned. Instead the open-source software enthusiast added a motion sensor to the baby’s crib, attached it to a miniature computer and tracked the child’s movements using Google’s website monitoring software. “I like measuring things like that. Especially around a time when mums want to scrapbook everything,” Miceli, who works in Philadelphia, US for Web Analytics Demystified, says. Miceli’s experiment was one of the earliest non-commercial uses of Google Analytics in sampling offline data. Two years ago Google released an updated version called Universal Analytics that could track information offline as well as online. Enterprise companies have been rushing towards Big Data – cross-analysis of buckets of information from different sources – to spot patterns that can predict the path to bigger profits. Google is pushing Google Analytics as a multi-purpose vacuum cleaner that can hoover up data from anywhere and turn it into a graph. Now Google’s popular tool for measuring website traffic has broken free from the internet and is coming to an office or home near you. Miceli didn’t stop with the crib. He attached sensors to light switches and reed switches to doors so he could see which rooms in his house were used the most. He used a thermometer to measure the impact opening a door had on room temperature. The wacky experiments pave the way to real-world applications, says Benjamin Mangold, director of digital and analytics at Loves Data. “If you’re doing advertising in Twitter or LinkedIn you can upload your spend and compare your performance against different channels,” he says. Offline ideas include comparing online registrations to an event with the final list of attendees. “You might find that AdWords is great at getting people to register but not at getting people in the door,” Mangold says. A business could tweak its marketing budget accordingly. Retailers are typically power users of Google Analytics because it can reveal trends in online shopping by tracking cookies. Some have taken the cookies offline by connecting to in-store counters – infrared beams that count the number of people walking in and out of a store – to measure the effectiveness of an online marketing campaign or website. “Google is going in a really interesting direction,” says Christian Bartens, director of “360 data agency” Datalicious. “Originally the idea was to open up Google Analytics to other marketing applications and to update the offline performance of the business. The open protocol which collects the data has proven to be far more versatile. Retailers have used free wifi services to triangulate the movements of shoppers in department stores and shopping centres. The accumulated data is then displayed as a heatmap over the floorplan, Bartens says. However, the program has its limitations. It is best suited to measuring data from e-commerce applications. “As soon as you get into other examples it becomes more fiddly and the outcome might not be as predictable,” Bartens adds. Australia has one of the most active communities of Google Analytics users, Mangold says. Loves Data organised the Australian annual user conference in Sydney yesterday. Renowned Google Analytics evangelists Avinash Kaushik and Justin Cutroni flew in to deliver keynotes, accompanied by a contingent of Analytics engineers from Google’s Mountainview headquarters. Miceli, like his peers, took Google’s claim that Google Analytics could track anything as a challenge. “I thought of the most outlandish thing and if I could do that then any client case would be easy,” he says. From checking in hotel guests to people walking into a store, Google Analytics is showing up in some unusual places. Two years ago Google released Universal Analytics, an upgrade to the Google Analytics software for measuring website traffic. The “universal” tag is more than a marketing line – the program can collect data from a host of online and offline sources and mix them together. The reports then show the impact of one input on another. Here are some of the less obvious uses of Google Analytics conducted by analytics geeks. 1. Coffee vs tea productivity test. Analytics specialists Loves Data connected RFID readers to the office hot beverage machine and measured the number of coffees and teas drunk each day by staff. When employees swiped a diagram for their hot drink at the machine, Google Analytics then measured their productivity while using the company’s business applications. “We wanted to see if there’s a relationship between coffee and tea to productivity,” says Benjamin Mangold, director of digital and analytics. 2. Finding the best guests. A hotel can connect Google Analytics to its e-commerce, check-in and billing systems. Analytics assigns a non-identifiable number (or cookie) to every online booking, and when the guest checks into the hotel the Analytics software can measure how many guests found through an AdWords campaign turn up and fulfil their booking. 3. Cleaning schedules. One company connected a Raspberry Pi micro-controller to reed switches to measure how often people opened doors to its staff rooms. They could then monitor the volume of traffic through each room with Google Analytics. “One of my old companies wanted to know which staff room is used the most and which should be cleaned the most frequently,” says Christian Bartens, director of Datalicious.